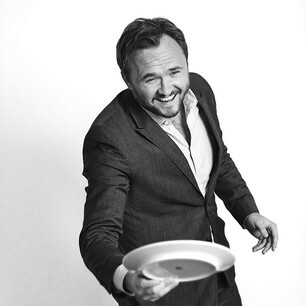 Dan Jørgensen, Denmark’s Minister for Food, set a European precedent in the summer when he asked Danes to vote for their favourite dishes. 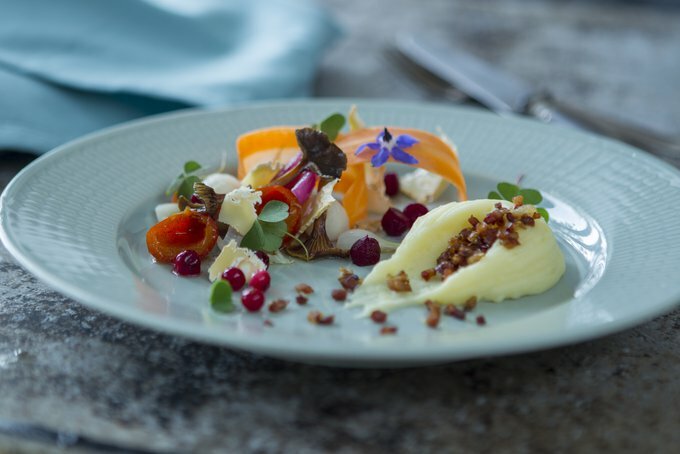 It is of no surprise to FE that the eight finalists from the various regions of Denmark are dishes that fall into the category of traditional food. First, with an overwhelming percentage of the national vote, was fried pork with parsley sauce. It was followed in second by open sandwiches, with slightly more than a quarter of the vote. Beef burger and onions was voted third by one in eight of the participants. Meat rissoles were fourth, mashed potatoes with bacon and onion fifth, fried apples with pork sixth, fried herring seventh and pork chops eighth. Pork featured in four of the dishes, five if meat rissoles (which are made with minced pork and veal) are counted. 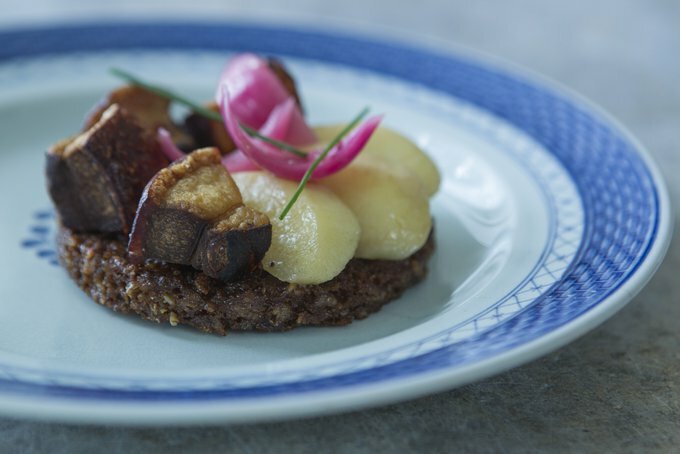 ‘The vote has sparked a debate about what is Danish food,’ said Minister Jørgensen, and the choice of a pork dish that is easy to make did not surprise him. 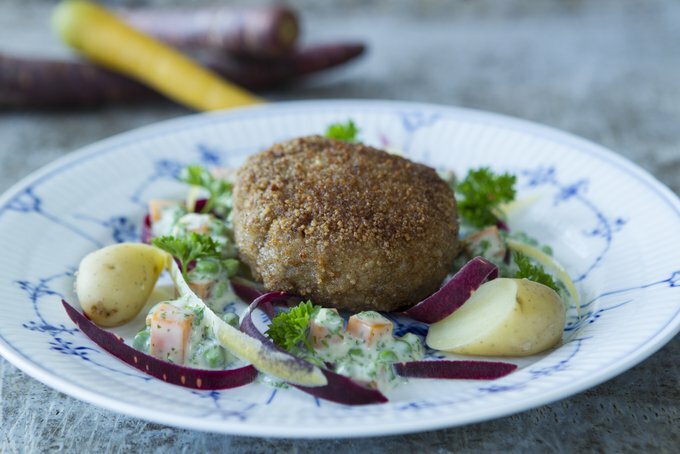 ‘It is a good old traditional Danish dish that can be made super delicious, and for many symbolises something that is also important in the discussion of food – namely tradition, comfort, and enjoyment. 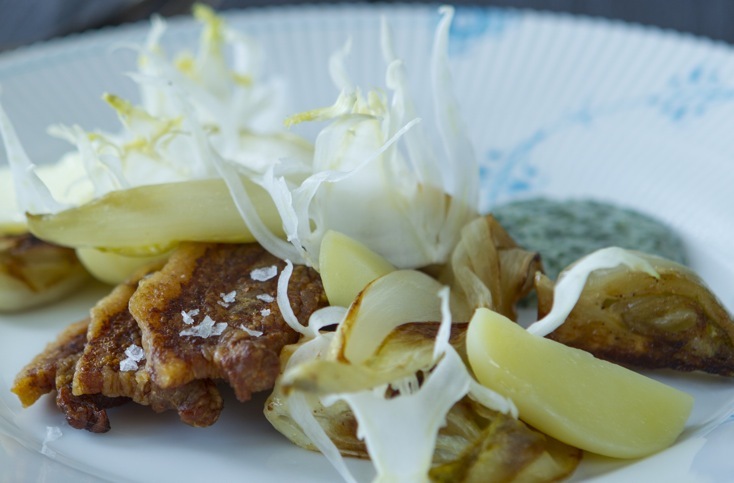 ‘Is it healthy to eat fried pork and parsley sauce every day? Of course the purpose of Minister Jørgensen’s initative has been achieved. Since the vote was announced on November 20 a lively debate has followed and intensified in the media, in the home and in the workplaces. We will follow the debate and report accordingly. 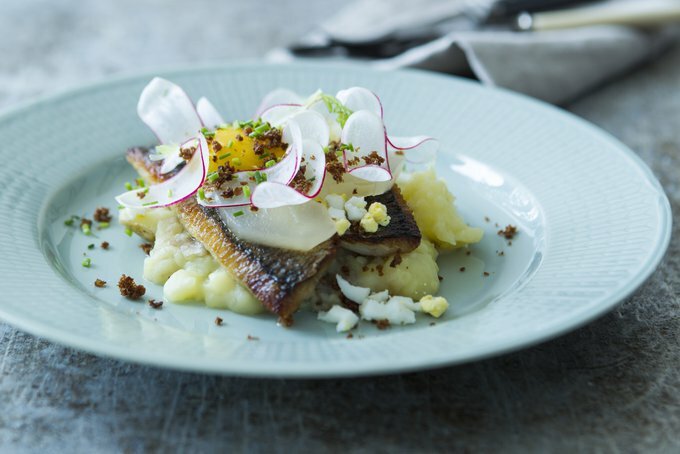 Here are the recipes of the Top 8 dishes in Denmark. It would appear that the Danes have not lost their love for roast pork. 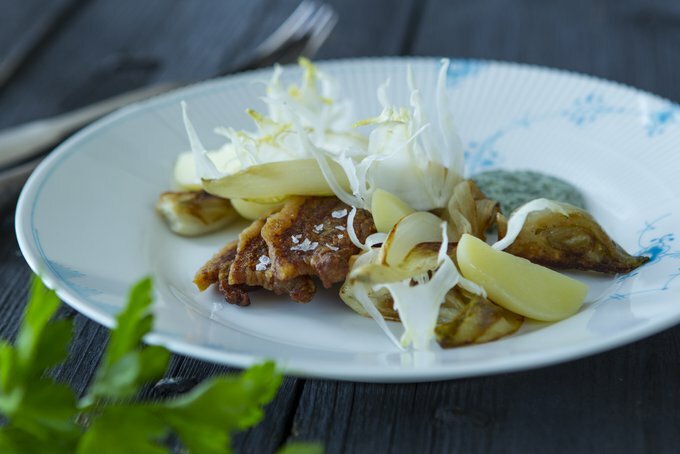 Traditionally stegt flæsk is a fried pork dish, served with parsley sauce. But it works better roasted in a medium-hot oven. The choice of belly pork is the secret. Many cooks believe this dish should also be served with vegetables, and fennel and endive are a good accompaniment. Preheat oven to 180°C with fan, 200°C without. Boil potatoes whole in lightly salted water, drain. Sauté endive and fennel in butter in a heavy bottomed frying pan over a medium heat. Add lemon juice, cover, reduce heat to lowest setting, leave to steam for 20 minutes. Place pork on a rack over a baking tray, bake for 15 minutes. The rinds should have started to crisp. Turn heat down and look again after five, and if necessary after a further five minutes. Make a roux with the butter and flour, add milk and whisk vigorously. Add sufficient potato water to loosen the mixture. Cook until the sauce is a creamy consistency. Season with a little salt, add parsley, as much as you like, keep warm over a low heat until ready to pour into a serving bowl. 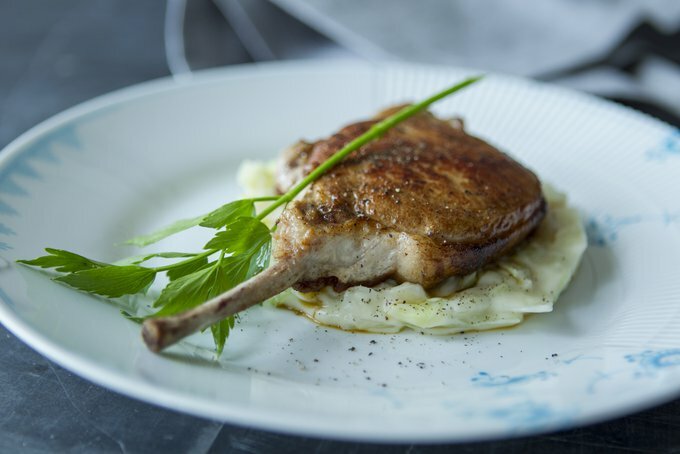 Serve four pork slices and a quarter of the potatoes to each person with a portion of the endive/fennel mix, garnish with lemon juice and thyme. 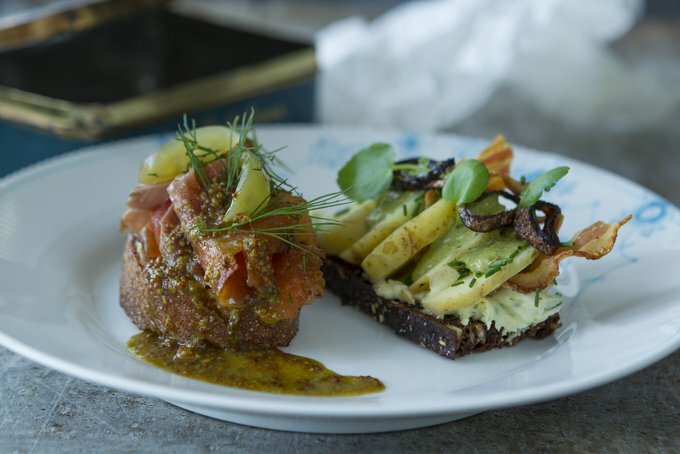 salmon on toasted sourdough bread with with fox sauce and pickled green tomatoes. Mash potatoes with butter, add cream, lovage and seasoning. Blend mayo and cress in a food processor until the mixture turns to a smooth green. Boil potatoes in lightly salted water. Leave to cool. Slice thin. Fry onions in butter and oil until golden and crispy. Remove from pan to absorbent paper. Spread butter thickly on bread. Place potato slices on top of the butter. Using a teaspoon heap dollops of green mayo onto potatoes. Top with onions. Garnish with cress. Combine mustard, sugar and vinegar in a bowl, adding oil slowly while whisking into a sauce. Stir in dill and season. Heat butter in a heavy bottomed frying pan over a medium heat. Place two slices of bread into 25 g of butter, fry until golden. Turn over and brown in residual fat. Repeat with remaining bread and butter. Put bread on absorbent paper. Arrange salmon on bread, garnish with tomatoes, dress with spoonfuls of fox sauce between the tomatoes. This is how beef burgers should be made, with lean meat and lashings of seasonings. The accompaniments follow the fried theme to a logical conclusion. Potatoes are obligatory with burgers, not chips or French fries. Toss vegetables in the oil, thyme, vinegar and seasonings. Peel potatoes, toss in a bowl with parsley. Sauté onions in butter in a frying pan over a high heat for three minutes, constantly turning. Add soy, sugar and water and simmer for 15 minutes. stirring occasionally. Season, remove from pan and keep warm. Form the meat into four burgers, about 2 cm thick, season. In a heavy bottomed frying pan sauté burgers in oil, four minutes each sides until crispy brown. Toss onions in the juices. Fry eggs in butter for a few minutes in a frying pan over medium heat. Traditionally coated with flour, egg and breadcrumbs, this version omits the flour and egg for a crust that is remarkably crispy. Boil carrots in milk for ten minutes, add nutmeg and peas. Reheat gradually with butter over low heat. Season and finish with parsley. Work the minced meat in a bowl until the fat comes off on your fingers, divide into four equal portions, shape into balls. Spread breadcrumbs on a plate, and coat the meat balls. Heat butter in heavy bottomed frying pan. Reduce heat to low and fry balls slowly until the crumbs take on colour, about seven minutes each side. Season. What Elvis thought of this rendition of Burning Love is not known, but the Danes adore it. A simple dish of mashed potatoes with diced meat and fried onions, and traditionally served with local produce. Cook potatoes until tender, drain and allow to dry over the heat. Mash potatoes, add milk and blend into a creamy purée. Season with a small piece of butter, nutmeg and seasonings. Fry meat in a pan without fat or oil. Remove when the meat has browned. Sauté onions in the fat in the pan until golden brown. Return meat to pan, and heat through with onions. 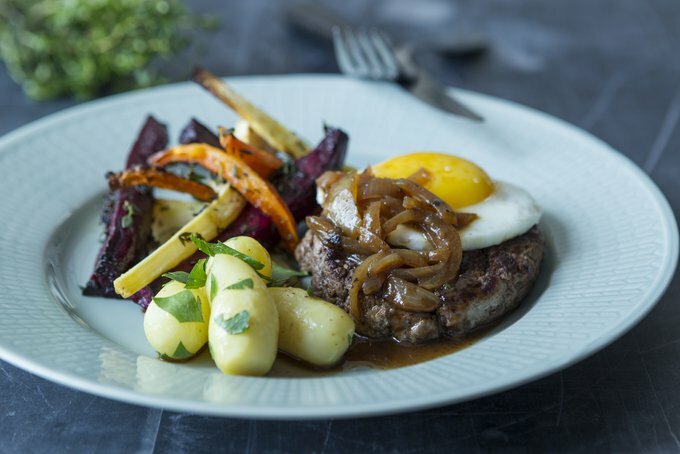 Serve with meat and onions on top of the mash surrounded by items of your choice.